This site is permanently closed, but you can look for similar offers in our guide. This site offers the hottest Flash scratch card games, online slot machines, fixed odds games, table games and lottery games with a chance to win jackpot payouts of up to 300,000 pounds/euros/dollars. At MegaMoneyGames every third scratch card wins. 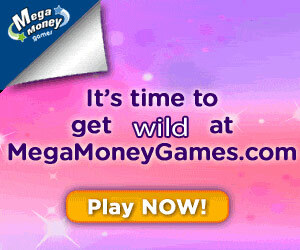 If you want to play for fun, 7 pounds/dollars/euros are given free without having to deposit money. Last but not least, they offer a welcome match bonus of up to 300% to gamblers who want to play for real money. Scratch Cards: Zodiac Fortune, Viva Mundial, Prince Charming, Golden Egg, Barn Vill, Hallow Win!. Slots: I Love Christmas, Crypt Keeper, Candy Land, Fruity Looty, Dino Mania, The Magical Forest. Lottery: Mega Bingo, Super Keno, Classic, Multi, Over Under. Table Games: Hold’em Poker, Blackjack, Casino War. Mega Money Games certify that they have a 95,5% real payout and that they will not send third-party advertising to their players.